Latest Custom Door made and installed in Sarasota , Florida.. 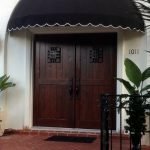 Door is made from Sapele hardwood . This door has wind and impact approval . Heavy /medium Distressed and Finished with Sikkens door and window sealer .